The Summer Red™ Maple is a wonderful shade tree, with an ever-changing display of purple-red leaves all season. 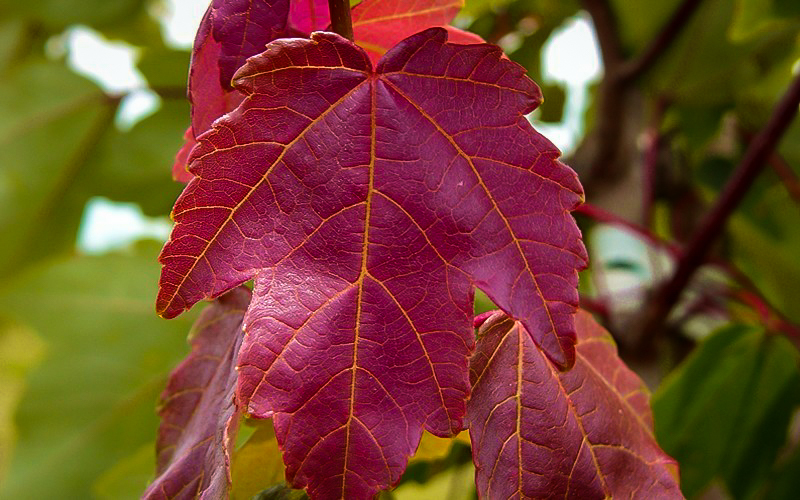 In spring it is completely covered in glossy, deep-red new leaves, and in summer the new leaves on every branch are burgundy red, while the older leaves become a rich dark green. Then in fall your tree will turn beautiful shades of glowing yellow. Why settled for plain green when you can have colors like this? It grows quickly into a beautiful upright shade tree, reaching 40 feet or more in time, with a spread of around 25 feet across. 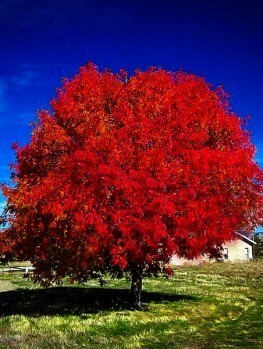 Plant it on a lawn as a superb shade tree, or as a richly-colored avenue along a driveway or property line. Plant it in the background of a larger garden as a focal point. The Summer Red™ Maple is hardy even in zone 3, and it’s a great choice for colder zones, while also growing just as well in hot ones. It thrives in richer, moist soils, and it’s the perfect shade-tree choice for damp areas, where it loves to grow beside water, or in low-lying areas where other trees fail. It also grows well in ordinary garden conditions, and it is usually free of pests and diseases, and it needs no special pruning or detailed care to become a great garden tree. Shade trees are essential parts of almost every garden, but a shade tree can be more than just green and shady. 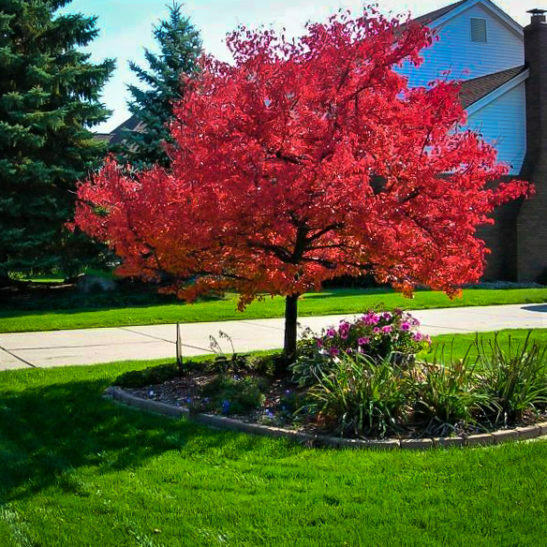 Some do have fall color, but with the Summer Red™ Maple you get color all the way from spring to fall, on an attractive larger tree that is great on a lawn for shade, and also thrives in wet areas where many other trees fail. If you have a low-lying garden, along a stream or lake, this is a great choice. Since it grows well in ordinary garden conditions too, and tolerates moderate drought once it is established. It’s also a great choice for any garden where you want more than just green leaves to look at. 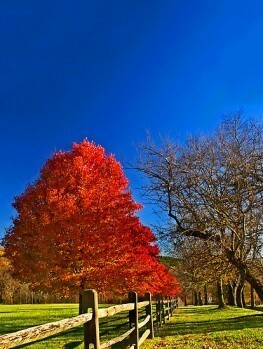 Ordinary maple trees have green leaves all spring and summer, but the Summer Red Maple tree is very different. The new leaves in spring are burgundy-red, turning the whole tree glowing red when that first flush of new growth appears. What a way to start spring in your garden with a bang. As the new growth lengthens and the leaves mature, they turn a rich dark green, but as new leaves continue to appear, they are still that lustrous deep-red, so for most of the summer every branch is red on the end, creating a fascinating dual pattern that brings color and life into your garden. In fall the leaves turn glowing yellow, bringing you a last flourish of color. The leaves are 2 -3 inches long and wide, and they are easily distinguished from other maples, as they only have three lobes, with sometimes two much smaller ones lower down the leaf. 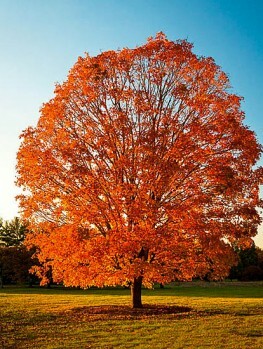 This is quite different from the well-known sugar maple, which has five distinct lobes. 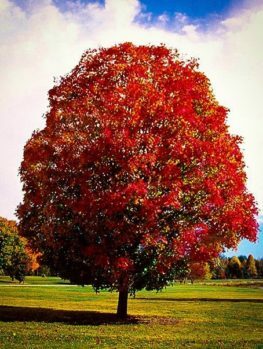 The Summer Red Maple is fast growing, adding 1 or 2 feet a year to its height when young, and slowing down only when it has reached a substantial size. It won’t be so long before it reaches its potential height of 35 to 40 feet, with a spread of 20 to 25 feet, so allow room for that when choosing a planting spot. Eventually it may even grow taller. Plant at least 10 to 15 feet away from buildings, property boundaries and existing large trees. Planted in a lawn it will make a great shade tree for family gatherings or just for lounging in the shade, as well as shading your home too. 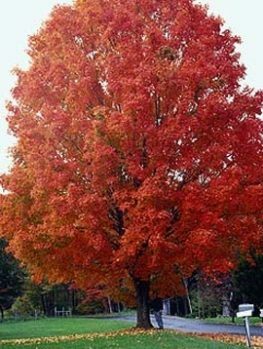 Plant the Summer Red Maple as a lawn specimen, or along a driveway. A row, spaced 15 feet apart, makes a great screen or boundary marker, that will always be colorful and interesting. It can be hard to find attractive trees to grow in wet areas, but this maple loves them, so if you have damp places in your garden, areas along a river, stream or beside a lake, this must be the tree at the top of your list. But don’t worry, if you just have an ordinary garden, it will thrive there too, and you can enjoy the ever-changing picture of burgundy and green leaves all summer long. 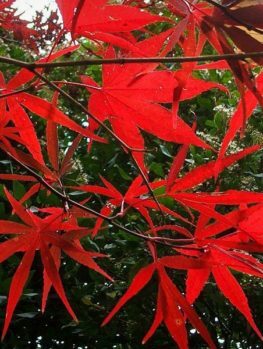 For red maples that are very suitable for drier gardens, take a look at the Red Sunset Red Maple tree, or the hybrid Autumn Blaze Maple tree, which are better-adapted to drier soils. 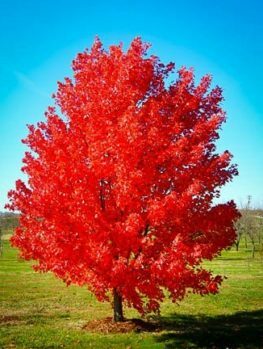 The Summer Red Maple tree grows from zone 3 right into zone 9, and there is almost nowhere in the country that this tree will not thrive, except for very dry states. It grows best in moist, richer soils that are acid or neutral. This tough and vigorous tree is very adaptable, and it grows well in most ordinary garden conditions. Water it regularly and deeply for the first few seasons, but once established it will tolerate ordinary summer dryness. If you have very alkaline soil, a tree like a Sycamore could be a better choice. It is rarely affected by pests or diseases, and it needs no special pruning – it will develop a lovely upright, spreading crown all by itself. Remove lower branches at the trunk if you need room to pass underneath, and then you will also be able to admire the beautiful gray bark of this tree. 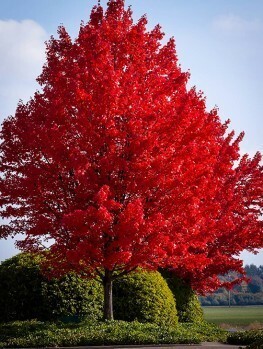 The Summer Red Maple is a special form of the red maple (Acer rubrum), an American native tree that grows all the way from Canada to northern Florida, and west into Texas and Minnesota. In natural areas they are usually found growing in damp places and along streams, but they are also found growing on drier sites. Robert H. Head and his family run Head Ornamentals Inc., a long-standing nursery in Seneca, South Carolina. They have bred many new ornamental plants, and the Summer Red Maple was found by them, perhaps as an unusual seedling, around 1990. They called it ‘HOSR’ (an abbreviation for Head Ornamentals Summer Red) and trademarked it with the name Summer Red in 2003. 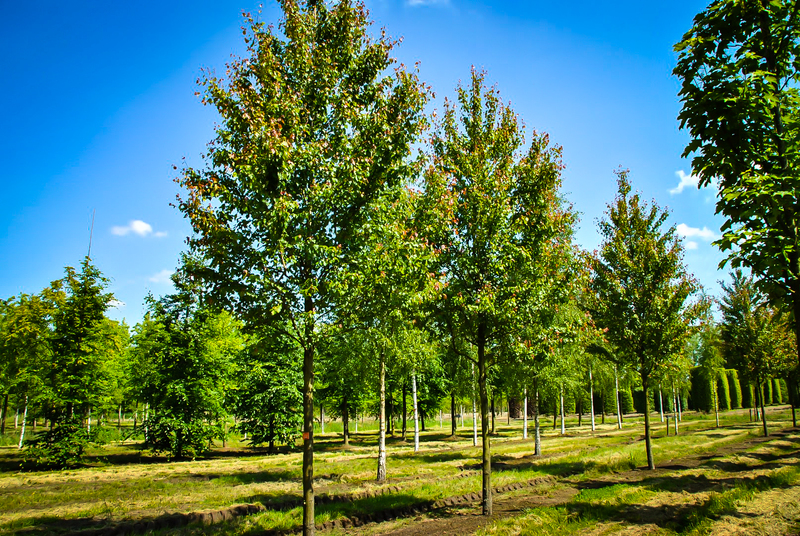 Our plants are produced by carefully selecting healthy buds from trees of this exact variety, and skillfully attaching them to roots of seedling red maple trees. These parts grow together to form a single plant, that vigorously grows into the healthy shade tree you will receive. Everyone likes exciting, fast-growing trees with special features, like the Summer Red Maple, so our trees will soon be sold out. Order now and enjoy a shady and colorful future.